Hut for Use, trial?.. taster of "The Good Life" !!!!! I have, fortunately, also 'recruited' a few 'friends' who have taken an interest in it's continued existence in years to come and they've wholeheartedly joined in whenever they can, family and work commitments prevailing. Unfortunately it is not getting the amount of use it deserves, or needs, to keep it looked after, even if it's only to open the door, clear out the mice and their 'leftovers', repair any damage, lay new poison... and leave! Anyone interested in a wee 'hutting adventure' can contact me, ask questions, location, state, access etc. (I intend to add more Posts regarding the hut's 'development') soon). Re: Hut for Use, trial?.. taster of "The Good Life" !!!!! What are the current sleeping arrangements, Stan? 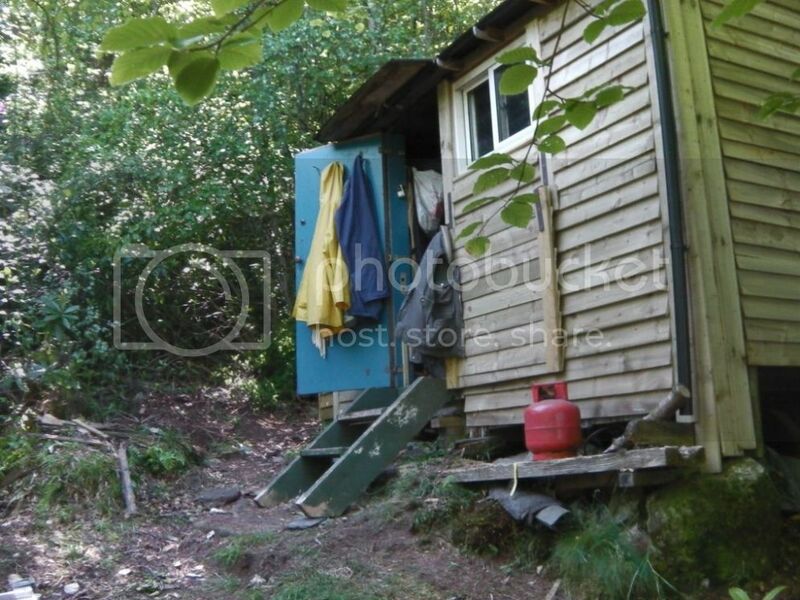 Hut a bit inconvenient for visitors overnight at present as I've got to refit the bunks etc. back together! Got half way through and took ill unfortunately. When done bottom bunk will become Double futon when pulled out or single as lounger. Single bunk overhead needs new support system provided.Room for the camp bed in floor area too.... Got things ready to go, just need to get myself over there, hopefully in the next couple of weeks. Whereabouts is your hut, Stan? Hope you are feeling better by now, Stan. What a lovely offer. I would certainly be interested sometime next year so do please send me a private message once the place is sorted (especially the loo!) What is access like? Distance, steepness etc. I'm getting on a bit though fairly active. Thanks again. Hi Jennifer, you're welcome. I was over last week, (for a funeral !, Old Mountain Bothys mate.....) didn't get enough done so still a work in progress. Hut still in use but a bit too 'rough and ready!' for the likes of yourself at the moment I would think. Will be fine for spring next year.. I don't see why not!!!. I'll message independently to those who have expressed interest and update my Posts, and FB, as I go along... got a few Posts "in Draft".. I've got a wee sequence of photos to illustrate the track too. The track, taken carefully, with pair of walking boots it's not too difficult although 'strangers' might like to use a walking pole for one wee bit, coming down... about 15-20ft or so only. More muddy, slippery, awkward when it's been wet, much easier in the dry. Have walking poles (and 10p!) so I'm really looking forward to next spring now. It will be good to see you at Hutters United sometime. Hi Stan. New to hutting and just found your post. You still looking for folk to support the Flintstone Hut? My other half's based on Holy Isle so not far at all and we'd both like to get involved. I too have just stumbled across this thread. My wife and I have always dreamed of having a little cabin out in some woods somewhere.. we are both very envious.. This thread sounds like a wonderful opportunity to experience the good life. Would it be possible for us to discuss what it’s actually like, and see what work and commitment is required to make the dream a reality. Arran is a little way from us here, we are in North Yorkshire, but I would love to discuss this lifestyle/hobby with other likeminded folk!